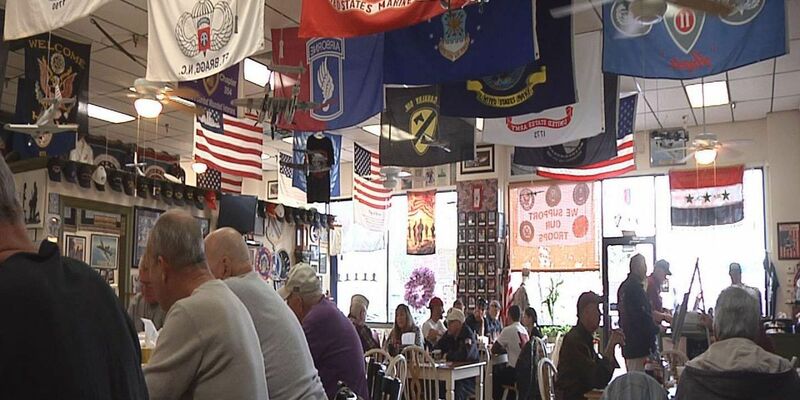 MYRTLE BEACH, SC (WMBF) - The walls of the Veterans Cafe are like a museum. But on Veterans Day, it's the conversations inside them telling the stories of many of the veterans eating here. "It's important for us, it's a day for us to just get together and more or less say thank you to each other," says Larry Truax, an Army veteran. They gather and swap stories from their days of service. "We have something in common that a lot of people, per say, the public, doesn't understand," Truex continues. "And they probably never will, unless they serve... what we've seen and been through in our lives." Tokens from different eras of service line the walls around them; awards and medals, uniforms, photos and hats from different times. Veterans peruse the history and talk about what they remember. Tommy Gibson served in the Army during a tumultuous time in our history: "Latter part of Korea, went to Korea twice and then Vietnam from Korea," he says. He spent the day with his brother, who also served in the Army. They were born and raised just down the road from the Veterans Cafe and Grille, in Socastee. "We owe a lot to our veterans, and not because I'm a veteran," Gibson says. "But we owe a lot to them because of what this country has become, and we need to stand up for them." Because if it came down to it, Gibson says many of our veterans would be right back where they were a month, a year or even decades ago for their country. "If we had to fight again, yes, we'd fight. Just about every one of us would pick up again and go." Many of the veterans eating in the Veterans Cafe and Grille have left pieces of their past behind in the cafe they enjoy. Every item on the wall was left behind by a local veteran.